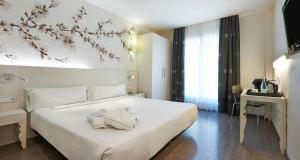 Hesperia Barcelona Ramblas is set in the centre of Barcelona’s old town, a few metres from Las Ramblas. This stylish hotel features free Wi-Fi access and rooms with satellite TV. 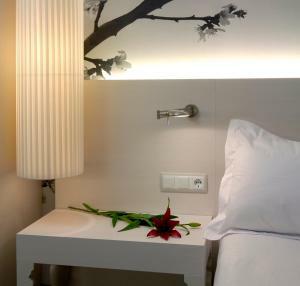 The Hesperia Barcelona Ramblas features contemporary design and its rooms are simply decorated. Each has air conditioning, a minibar and a desk. The Hesperia Barcelona Ramblas is ideally situated for visiting Barcelona’s main attractions. There are several restaurants, bars and cafés in the nearby Gothic Quarter and the famous Boquería Market is less than 100 metres away. Barcelona Port is a 10-minute walk from the hotel and the city’s cathedral is one kilometre away. Liceu Metro Station and Liceu Theatre are a 1-minute walk from the NH Barcelona Ramblas. Please note that the breakfast is served at the following hours: Monday to Friday: 07:00 - 10:30; Saturday: 08:00 - 11:30; Sunday and public holidays: 08:00 - 12:00. This modern room features a flat-screen TV, air conditioning or heating, a minibar, safe and a private bathroom with a hairdryer. Rate: € 87.12 ... € 227.30; select dates below to get current rates. These more spacious rooms include a flat-screen TV, coffee machine and kettle, air conditioning or heating and a safe. The private bathroom comes with a hairdryer, bathrobes and slippers. Guests also receive a welcome gift and the minibar is free on the first night. This modern room features a flat-screen TV, air conditioning or heating, a minibar, and a private bathroom with a hairdryer.